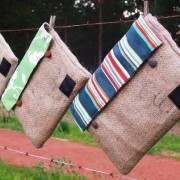 A new range of laptop sleeves made from recycled hessian coffee sacks is raising the bar for sustainable fashion in Cape Town. Launched in August at the Vodacom Young Entrepreneurs event, Sweet Potato has now sold over 250 sleeves and bags in craft markets all over Cape Town and Stellenbosch. Team member Tim Barlow says that the response to the product has been “very encouraging”. Sweet Potato is the brainchild of a group of students from UCT’s Management Entrepreneurship postgraduate programme. Students on the programme started the year by being briefed to network amongst themselves and find a team that was as diverse and demographically representative as possible. The Sweet Potato team is therefore an eclectic mix of young men and women from a variety of different backgrounds and academic disciplines, ranging from engineers to psychology majors. Rather than just business partners, Barlow says that for any differences the team have become “close friends” which “has helped so much”. The group’s eclecticism seems to have had obvious influences on the end product. Though primarily made from the hessian coffee sacks, the sleeves and bags also feature colourful buttons and patchwork fabric off-cuts from local fashion designers. And even the coffee bags themselves often have a unique quality, being brought to South Africa from all over the world by the company Global Coffee, who gave the Sweet Potato team the sacks for free when they found out what the project was about. In fact, Barlow says that this kind of helping hand has been characteristic of Capetonians’ and local businesses’ attitude towards the project since the very beginning. Having set out with just R50 in their pockets, the Sweet Potato team managed to get sponsorship from Bos Ice Tea and Rolling Stone for a stall on Jameson plaza where they then sold boerwoers rolls, cans of ice tea and Rolling Stone magazines to students. They managed to make a total profit of around R10,000. With all this in mind, Barlow says that the “laid back culture” of Cape Town is certainly “very accommodating” to entrepreneurs and that there is, collectively, “a big push towards creativity” in the city. In return for the support they have received, Sweet Potato have endeavoured to give back to the local community through their product. Their bags and sleeves are made in the factory of a local entrepreneur in Grassy Park whose entire staff consists of local underprivileged women. The product is, therefore, not only sustainable and environmentally friendly thanks to its recycled nature, but is also helping to support other local entrepreneurs and provide work. With the postgraduate programme nearly finished for the year, Barlow says the team remain unsure as to the future of Sweet Potato going forward, but reiterates that the whole thing has been an “incredible experience”. Supernews has previously covered two of the other brands that emerged from this programme: Bamboo Revolution watches and Woot pens. This entry was posted in Design and tagged Cape Town, education, entrepreneurs, sustainable, UCT. Bookmark the permalink. Love these – where can I get my hands on one in Cape Town? Would like to receive the news!